The Landscape Expansion Index (LEI) is proposed by Prof. Xiaoping Liu (Xiaoping et al., 2010), which is aim to give a deeper insight of landscape patterns and temporal dynamics. In addition to identifying the types of landscape expansion, LEI can also be used to describe the process of landscape pattern changes within two or more time points. where LEI is the landscape expansion index for a newly grown patch, Ao is the intersection between the buffer zone and the occupied category, Av is the intersection between the buffer zone and the vacant category. LEI have been applied to the measurement of the urban expansion of Dongguan in Guangdong province, China, for the period of 1988–2006. The analysis identifies three urban growth types, i.e., infilling, edge-expansion and outlying. A further analysis of different values of LEI in each period reveals a general temporal transition between phases of diffusion and coalescence in urban growth. This implies that the regularity in the spatiotemporal pattern of urban development in Dongguan, is consistent with the explanations according to urban development theories. 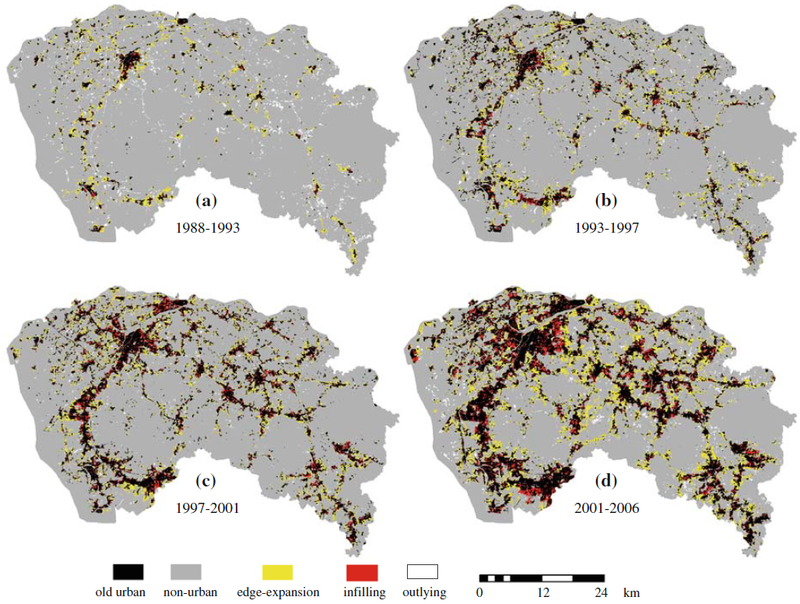 LEI and its variants can become an important tool for capturing the complex dynamics of urban growth by using multi-temporal remote sensing data. In contrast with conventional landscape indices which are capable of reflecting the spatial characteristics for only one single time point, LEI and its variants can capture the information of the formation processes of a landscape pattern. Being the supplement to the conventional landscape indices, the LEI and its variants are more capable of quantifying the spatial patterns of landscape expansion within two or more time points, and examine the way in which a landscape evolves, and reveal the relationships between the spatial distribution of a landscape as well as its evolution process.